Surrounded by tall trees, Tamarisk condos for sale are at the corner of Broken Lance and Columbine Drive, a tremendous location that gives them easy access from Highway 9, to downtown Breckenridge and the base of Peak 9. All Tamarisk condos are in one sleek building that is staggered so all the units get plenty of sun and good views to the Tenmile Range. The exterior is elegantly charming with wood with brick columns; and the use of brick is carried inside and repeated in modern, clean fireplaces. Large dramatic windows fill the vaulted living areas with light. A tall, thin, floor-to-ceiling window makes the design of these roomy condos even more unique. Start your search with the Tamarisk condominium listings below, or find out more about all the nearby amenities. 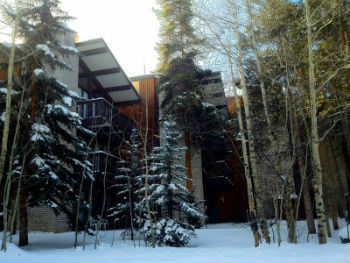 Tamarisk was built in 1971 as a high-end condo complex with common land reserved around the building. It’s careful construction and design have encouraged homeowners to remodel in a similarly high quality manner. Tamerisk is on the outside of the Columbine loop, which is a neighborhood just south of the core of downtown Breckenridge. A quick trail through the woods make it easy to ski over to the base of Peak 9, and in the summer when the Blue River is flowing footbridges will take you across. All the condos on the Columbine Loop share use of the Columbine, or Four Seasons, pool and clubhouse, which has an outdoor heated pool and several hot tubs. The free town shuttle stops nearby and makes everything in the Breckenridge area accessible. Trails into the national forest begin a few hundred yards up the ski hill from the base of Peak 9 and also across the road in the Breckenridge open space area of Illinois Gulch. Size: 850 to 1240 sq. ft. Located at 935 Columbine Road in Warriors Mark, across the Blue River from the base of Peak 9, on the inner circle of the Columbine Loop, just south of the Columbine neighborhood pool. Drive south on Main Street to last stoplight at Boreas Pass Road, turn right on Broken Lance Drive. At the three-way stop make a left and remain on Broken Lance, take the next right on Columbine, Tamarisk will be immediately on the right. Snowdrop Condos are across the street, Pine Creek Townhomes are the next subdivision on the right side of this loop. Give us a call at (970) 453-2200 or send us a message online to talk to one of the knowledgable Breckenridge Associates agents. We have the Breck real estate information that you need.